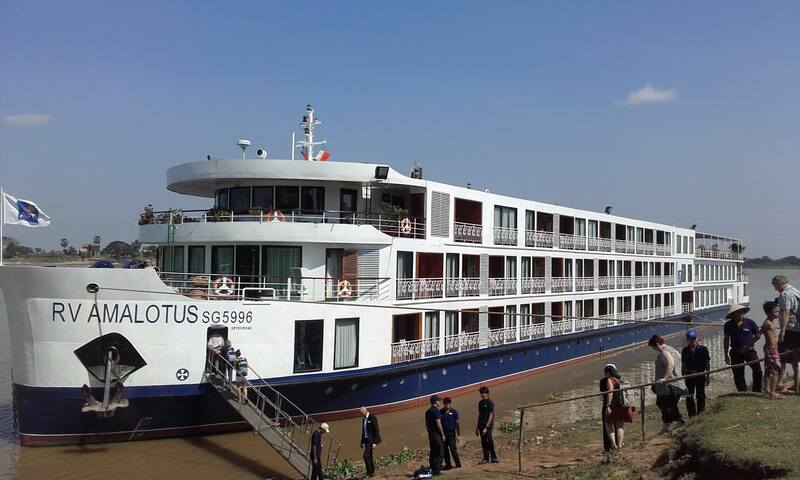 I have just returned from the amazing countries of Vietnam & Cambodia, experiencing a luxury cruise along the Mekong with APT. What an experience! Not only did I see some gorgeous scenery and meet the loveliest, happiest people I think I’ve ever come across – but I got to experience it in style aboard the RV AmaLotus – one of the most luxurious ships to cruise the Mekong, enjoying the fully inclusive hospitality that APT is renowned for. I flew with Singapore Airlines, an airline I hadn’t flown with for quite awhile, but who did not disappoint with their fantastic service and extremely comfortable aircraft – nothing less than I have come to expect from them! Upon our arrival in Siem Reap we checked in to the gorgeous Sofitel Angkor Resort & Spa for a night prior to embarking our 7 night cruise. This resort is a beautiful oasis in a bustling, noisy (but fun) and hot city where you can spend time playing golf or just laze by the resort pool and sip cocktails. 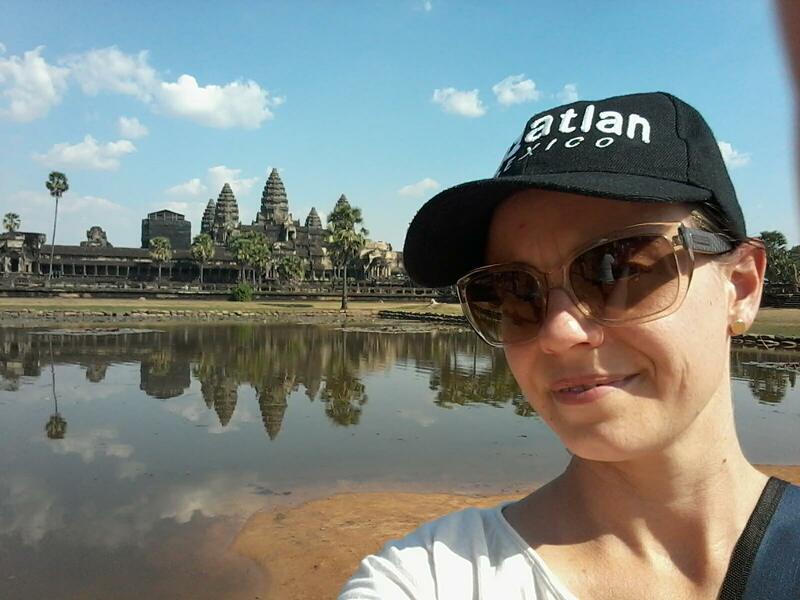 With no time to spare though, we quickly jumped in tuk tuks and headed out to Angkor Watt, Angkor Thom and Ta Prohm to be blown away by the size and beauty of these temples. This was a bucket list moment for me, but one that delivered so much more than I had even expected. 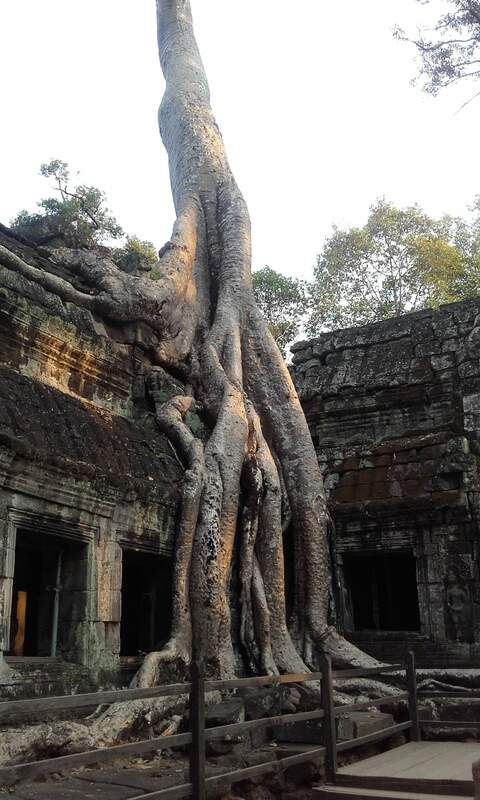 The size of the temples and the area they cover was far more than I had anticipated and you could easily spend days wandering through the different complexes that lie within the Angkor Archaeological Park. 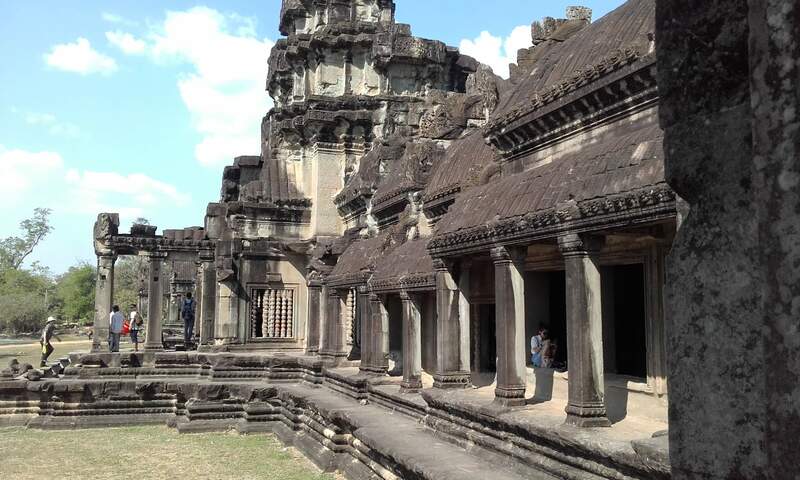 Each of the three main temples we visited are all so different, with different levels of ‘ruin’ and architecture. I loved every minute of it. As the sun was getting lower while we were at Ta Prohm we experienced some really beautiful colours and shadows over the temples that photos cannot do justice, but that will forever be imprinted on my heart. 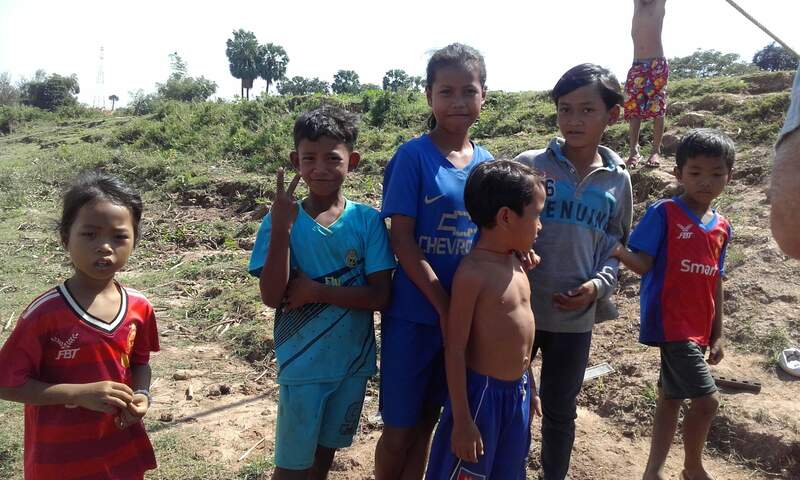 The following day we travelled down to Kampong Chhnang where we were greeted by the local children as we boarded the luxurious RV AmaLotus for our cruise along the Mekong. As always with APT everything is of the highest standard, including the food (of which there is plenty of! ), the staff onboard are the best you can get, and the tour director and local guides cannot be beaten. The other guests also add to your experience and by the end of the 7 nights I felt that all 79 of us had known each other for years! 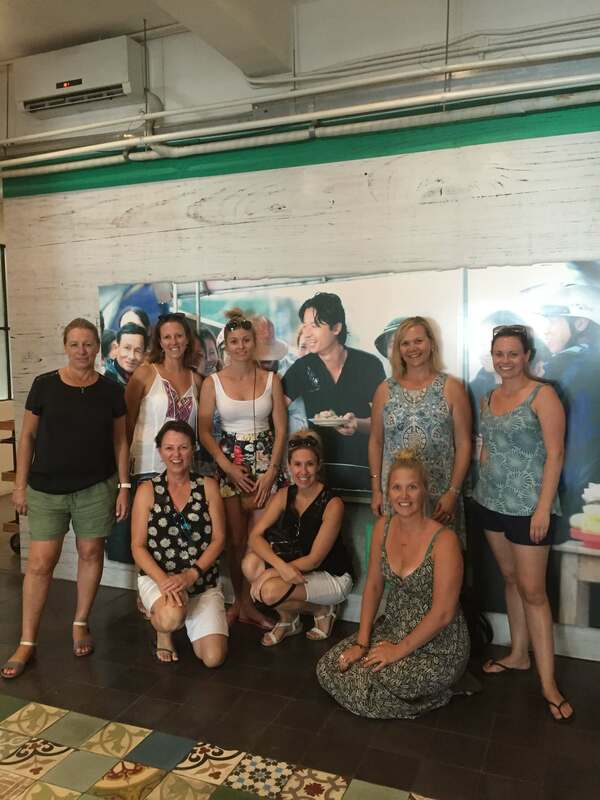 If food is your thing, you may interested to know that acclaimed Vietnamese-Australian chef, Luke Nguygen, has designed exclusive culinary experiences on some of these trips. 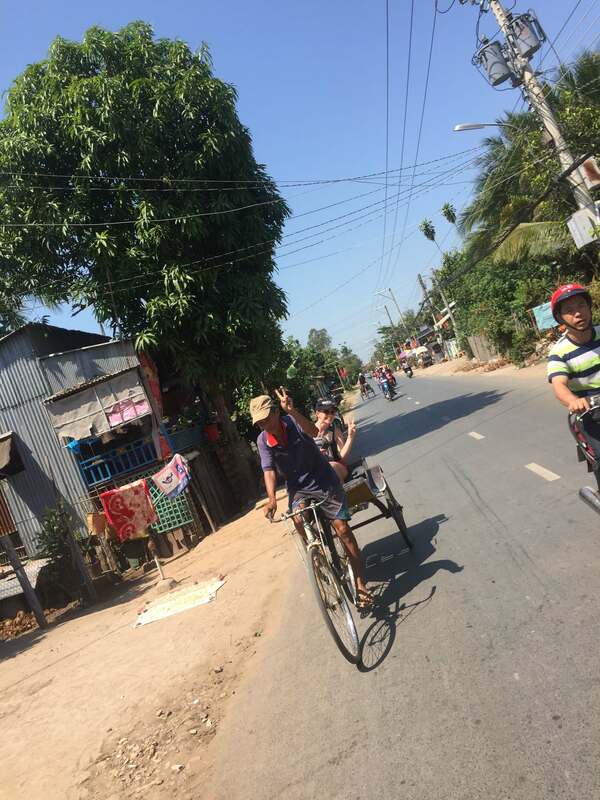 Cruising the Mekong allows you to visit small and local villages that you otherwise wouldn’t see and where our presence really is making a difference to the local people. A welcoming party of children and adults await you at every village, all very happy to see you. They like to practice their English on you, and are proud to show you their country. Some will try to sell you things, but they are so polite and not as pushy as you see in big cities. Some of the staff from the office and I bought lots of pencils and pens to the give the children. This small gesture was in no way seen as small in their eyes. I was given flowers by the children that they picked as we walked through their village streets, seeing where they live, go to school and work. There were many moments like this in my week that had me close to tears (and I have tears now in my eyes as I think about this) where the kindness of the local people was almost too much to take – especially when you know of the heartbreak and atrocities that they have so recently experienced. Now, transport on this trip wasn’t just by waterways. 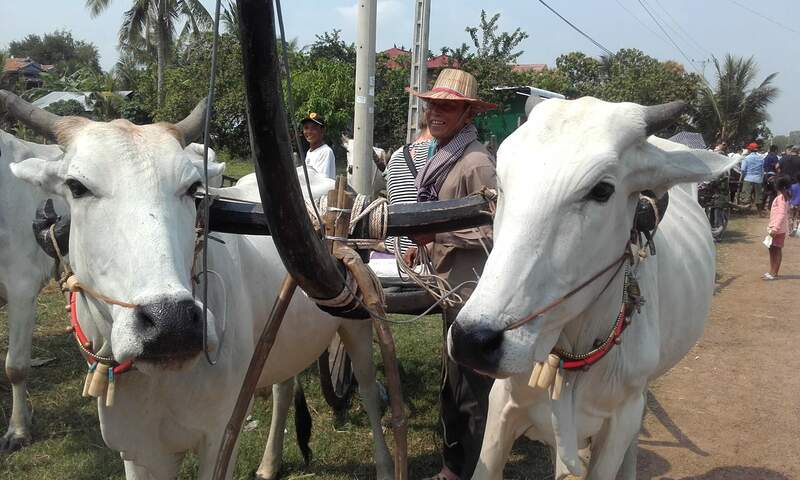 We experienced some interesting and fun ways of local travel including an ox cart ride past rice fields in the countryside, a rickshaw ride through the village of Tan Chau – one of the last places in Vietnam that you can experience this way of travel – and of course a cyclo through the busy streets of Phnomh Penh. Be prepared for sore arms from all the waving and plenty of smiling – I can’t say enough how friendly, happy and welcoming the local people are in this part of the world! Although this was one of the best trips I’ve taken it was also one that was very hard. 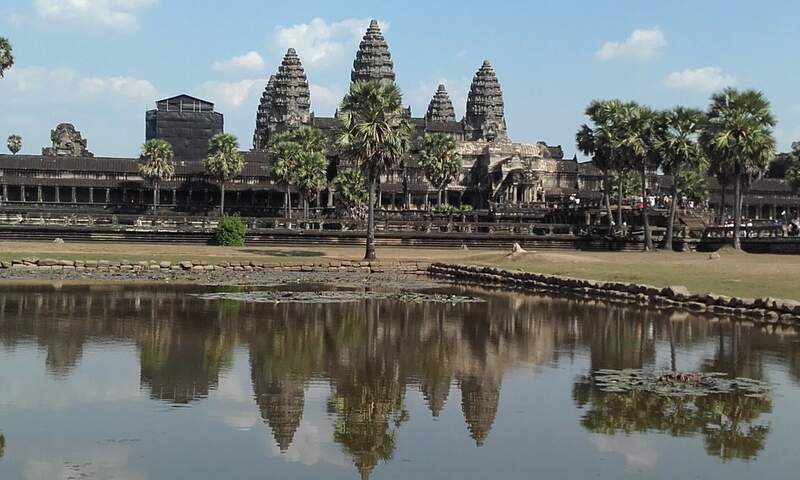 The Cambodian people have suffered greatly and although they don’t show it outwardly it is very noticeable in the streets the lack of older people, especially men. When we would meet an elderly man or woman it was extremely heartbreaking knowing the atrocities they had lived through and the reason why they were unique. It was a very hard decision to make but after falling in love with the Cambodian people and country in only 1 day I knew I owed it to them to see for myself the Killing Field and the S-21 Genocide Museum. I felt I couldn’t have the good of this country without respecting the worst that had happened to them. There was nothing nice about this day and as soon as I returned to the ship I ordered a very stiff drink – but I appreciated every other day and encounter I had in this beautiful country even more than I had before. 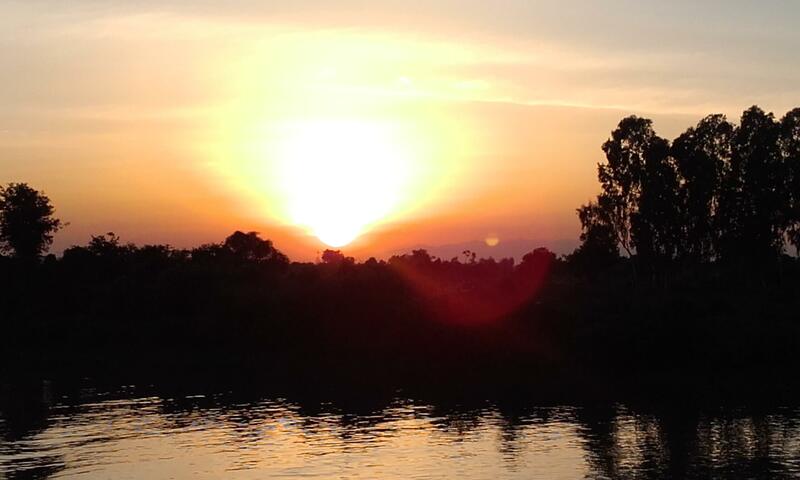 Along the Mekong you will experience a completely different side to Vietnam that you would normally see. There aren’t thousands of tourists through each day, in fact you may be the only ship through and it truly feels that you are visiting an untouched and remote part of the world. Each morning if you are up early enough you can watch the silent fisherman laying their fishing nets, the floating shops where whole families live and work at the family business and the colours change as the sun rises. As the sun sets the colours are amazing and I witnessed one of the most beautiful sunsets of my life, all with those same fisherman going about the task of hauling in the fishing nets in the same silence that they put them out. Breathtakingly simple but wonderful. 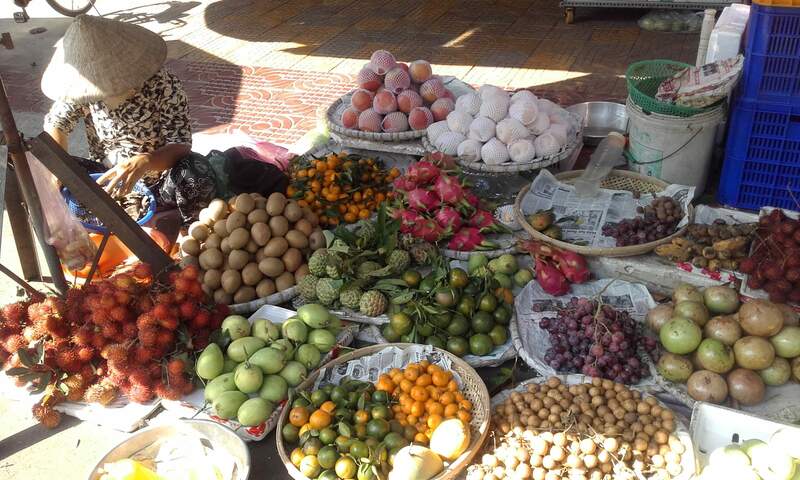 A trip on the Mekong with APT guarantees lots of delicious food, amazing guides and their knowledge, beautiful accommodation and facilities on your floating home but mostly it promises lots of laughter, unique moments and unforgettable memories. This was an amazing experience that I will never forget but one day hope to do again. This trip made me feel like a true ‘traveller’ again rather than a ‘tourist’ and reminded me of what made me fall in love with travel in the first place!